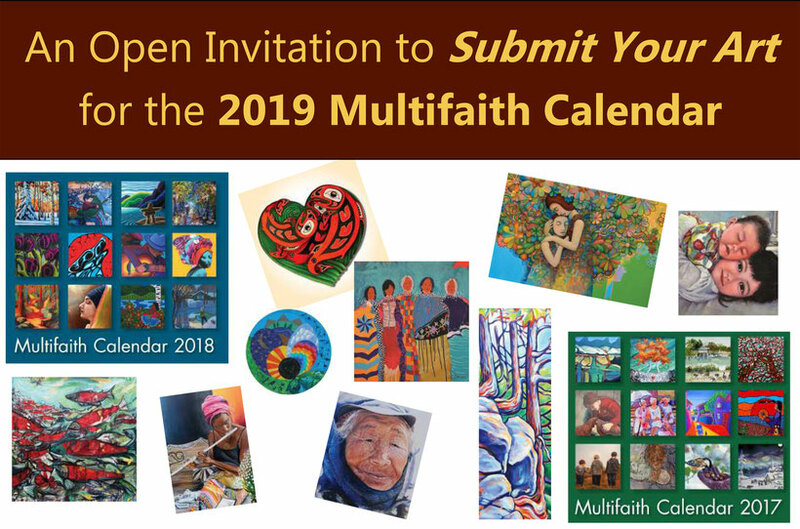 Each year, the Multifaith Action Society invites artists to submit works of art for consideration of inclusion in its upcoming Multifaith Calendar. The theme for the 2019 edition is: Coming Together: Exploring New Connections. In a world where disasters, violence and fear dominate our evening news, it is easy to become afraid and want to raise walls to protect ourselves. But, it takes exactly the opposite approach to change the tide of popular culture. Rather than separate and divide even further, now is the time to take down walls, and come together in new ways. This year, we are asking what connects us? Is it, for example, relationships, economies, politics, a sense of place, a unique culture? What brings people together in dialogue, action and creativity? How do we build new bridges across old divides? Let’s look for new paradigms on how to actively engage with each other that holds the promise of inclusion and not exclusion. Let’s envision all the wonderful ways to connect. We believe there are so many ways people do come together. or perhaps to build communities. We are all one in spirit, but how can we show this inner connection - physically and in our everyday lives? This year, show us how you come together and how you explore new connections. Please submit a work of art in any medium that showcases our theme. Our aim is to produce a Calendar that will include a variety of interpretations on the theme while creating a visually cohesive Calendar. We encourage all artists to submit images including artists who have had their work showcased in past. Selected artists will be offered an honorarium of $250 for a month Calendar image, $500 for the cover image and $100 for smaller inset images placed throughout the Calendar. In additon, artists will receive a set of complimentary Multfaith Calendars. Submit digital images in low resoluton (72 dpi) to: artsubmissions@multfaithaction.org. Should your piece be chosen, we will request a high-resolution file (i.e. 9” x 9” @ 400 dpi—JPEG or TIFF). The deadline for submissions is January 19, 2018.